Beaded fringe is a decorative border made of beads that is added to finish the edge of beadwork, fabric, or leather accessories. Beaded fringe is often used in costumes, handbags and jewelry to add movement and sparkle. In beadwork, fringe is an easy and decorative way to finish edges. It is often used in earring and necklace designs. There are many unique types of fringe you can use. From the simplest straight fringe to the more complicated leaf and branched fringe, here is a list of some of my favorites with links to step by step tutorials on how to make each type of fringe. Straight fringe is the easiest type of beaded fringe to make. Straight fringe consists of multiple strands of loose beads that hang in a straight line. Straight fringe may be short or long and it may be all one length or angled depending on the design. Straight fringe is often used on brick stitch earrings, to finish beaded amulet bags, or to embellish necklace or bracelet designs. Even though straight fringe is the simplest fringe to make, it is never boring. One of the easiest ways to dress up straight fringe is by varying the types and numbers of beads in the fringe. Try using tube beads made from glass, bamboo or bone. You can also hang metal pendants and drops from the points on the end to customize straight fringe. Crystals added in to the center of the design add sparkle and weight to help the fringe hang straight. Even the number of beads in each column can be changed to provide interesting variations in every project you make. A variation of straight fringe is the tassel, which is when multiple strands of fringe are grouped together in a rounded tuft on one side. Looped fringe is another one of the easier types of beaded fringe. Looped fringe consists of multiple loops of seed beads. Looped fringe can be simple or extravagant, long or short. Short looped fringe is an ideal border for loomed bracelets since it can help cover the thread edges while adding a great decorative detail. Looped fringe also looks great on brick stitch earrings, amulet bags or pendants. It can be made very simply by just adding loops of seed beads to your beaded jewelry project, or looped fringe can be made very intricate by the addition of drop beads, daggers and crystals. This type of beaded fringe also looks great when you vary the size of each loop. Twisted fringe is a variation of looped fringe. 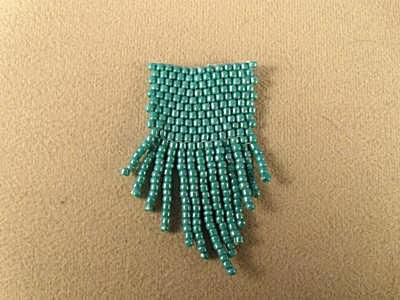 It uses loops of beads that are twisted around each other for a sleek, tailored look to your fringe. Making twisted fringe is a little trickier than straight or looped fringe. Once you make the twist, you need to be careful to maintain the twist while you secure the fringe in place on your beadwork. In addition, the twist in the fringe also twists the thread, making it more likely to knot as you are securing your strand of fringe and starting the next strand. For these reasons, twisted fringe is slightly more challenging to learn to make - but it is well worth taking the time to do so! You can change up basic twisted fringe by adding bugle beads, gemstone beads, and Swarovski crystals at the bottom of each strand. Leaf fringe is combination of straight fringe alternating with leaf shaped loops of beads. You may use leaf shapes throughout the fringe or only towards the end of the strands. Either way, leaf fringe makes a very full-bodied fringe. Leaf fringe is a great addition to your nature-themed jewelry and beadwork projects. Leaf fringe can be very natural looking when made with Japanese or Czech seed beads, but also looks great when made with cylinder beads. Add tiny gemstone beads, Swarovksi crystals or other accent beads for an extra special border. Branch fringe is a fuller variation of straight fringe. Each fringe strand consists of multiple legs or branches or straight fringe. Similar to leaf fringe, it creates a more intricate full bodied fringe than straight fringe. Branched fringe works very well with nature themed projects, especially beach, sea or woodland themes. You can make branch fringe look like coral by making short branches off the main branch. Add freshwater pearl and tiny shells to emphasize the sea motif or add Swarovski crystals for sparkle.